The mortar used is of an unknown origin. It has been analyzed and its chemical composition is known but it can't be reproduced. It is stronger than the stone and still holding up today. If you broke the Great pyramid into slabs 30 cm thick you could build up a wall 1 metre high that would stretch all the way around France! If you had a little more time you could cut it into rods about 6cm 2 - join them together and it would be enough to reach a quarter of the way to the moon! 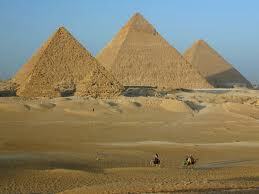 Some people have said that the pyramids are more than simply large graves; they were granaries or treasure houses. All of the pyramids were probably robbed of their treasures within a couple of hundred years of the burials. The only tombs to escape until modern times were those dug into rock, not placed in pyramids. They belonged to Tutankhamun and Queen Heterpheres. The Egyptians mummified more than their pharaohs. They also mummified the Pharaoh's pets and buried them in the pyramids to keep the dead kings company. If you could weigh an average pyramid it would be around 5,400,000 tons. The average stone block weighs as much as 2 modern cars (2.5 tons). The largest single stone block (in the pyramid of mycerinus ) must weigh about 285 tons- that’s 200 to 250 cars. Pyramid -builders tried to fool thieves by placing a blocking stone at the end of a passageway and plastering it in. If thieves broke through the plaster then they would come to the stone and give up. The real way into the tomb would then be through a hidden trapdoor in the ceiling. The Egyptians didn’t have accurate measuring tape. They used fibre-cords that could shrink or stretch. Still, the greatest mistake in the Great pyramid in just 20cm on the side of 230 metres. They were even accurate in building a flat base. The Southeast corner is just one centimetre higher than the North-west corner. The pyramids are not the most awesomely large human construction. The Great wall of China is much more awesome and the Mexican pyramid of Quetzacoatl is an even more awesome 54 metres tall and has a volume of 3.3 million cubic metres. The Great pyramid of Cheops is just 2.5 million cubic metres. But the pyramids of Egypt are the oldest stone buildings in the world. Early tombs were flat-topped. These were called Mastabas because they looked like the mud brick seat found outside Egyptian peasant homes. Mastaba tombs were easily robbed. So someone built a slightly smaller Mastaba on top of the first one then another on top of that, then another, and they ended up with a step pyramid. It is forbidden to climb the pyramids today. There have been to many accidents, so now you have to have special permission.